A fellow KCBS competitor David Stidham opened a joint somewhat on a whim, had heard such good things about it me and another 'trailer trash' BBQ guy made the 7 hour road trip for lunch! David DID NOT disappoint! 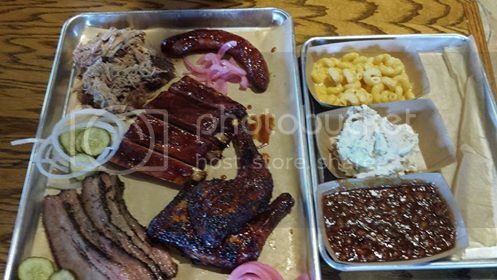 He slapped together a 'pitmaster sampler' for the two of us, and just kept bringing more 'samples'! I had said to Alex "I dont need to ever eat another piece of pulled pork" before digging into this...Well, NOTHING went into the garbage! This entire meal was of "turn in " quality!! From taste and tenderness on everything, the glaze he applied to the wings and even sausage [ yup, wasnt expecting that either, but it REALLY worked!! ] to the 'spicy lemonade"...Home made lemonade with jalapeno's floating in the mix!! I AM NOT saying this just because I know the guy, I was blown away!! He was the head of marketing for a breakneck speed growing Mid-West hamburger chain, and applied all he knows form that job AND his pitmaster skills to opening this place, and it WORKS!! We even happened to be there as a St Louis paper showed up to do an expose on the place, and made the paper!! Check out the worlds most expensive order station! A Jambo Pit he took 6th place at the Jack on, having never cooked on it before, or since!